1. Frosted surface, keep balance and stability whilst preventing your floor from scratching by sharp metal legs. 2. Protecting the internal section of the application, and prevent daily factors such as water, dust and so on. Pro-long the life of the application. 3. Make moving easy and noise-free by installing them to the bottom of the application, such as chairs and desks legs. 4. Easily fitting into the end of your required application, these tube inserts promote a solid structure when measured properly. 5. Can be used as furniture inner inserts, suit for tables, chairs, sofas, benches, stools, and so on. They are applied to gym equipment, carport, boat trailer, wave runner trailer, tire carrier, gates post, iron fence post, roof racks, golf cart and grooming table as an insert tubing. You can just finish installing tap item with your hand or a hammer to secure fitting. This kind of product without the need for fixings, adhesives. Our product is made of strong plastic, if the tube insert that you ordered is a bit large, you can tap with a hammer or cut a bit to fit the application leg. 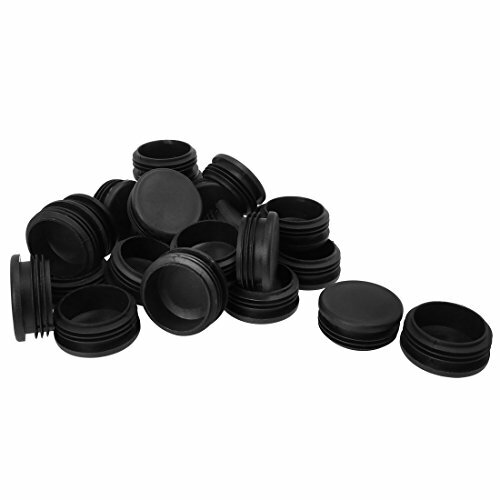 Material: Plastic; Package Include: 25 x Tube Inserts; Total Size: 50 x 21mm/2" x 0.83"(D*H); Thread Diameter: 49mm/1.93"; This tube insert suitable for leg diameter is 47mm-49mm/1.85"-1.93"